Ron Garan aboard the International Space Station just send this photograph of Petermann Ice Island PII-A down to earth as reported by Jason Major. While the detailed photo indicates that the ice island was about as close to the coast as it is long, it has since moved offshore and to the south. The ice island is on its way to clear the similar sized island of Belle Isle in the middle of a channel that separates Labrador in the north from Newfoundland in the south. The distance from the coast is not all that relevant, but the water depth is. Classical physical oceanography says so and I urge you to watch this MIT movie. In a nutshell: The rotating earth limits large-scale flows, such as those that propel the ice island, to move in ways that seem to make no sense. More specifically, if there is a tiny change of the bottom depth, then the flow at all depths, and this includes the surface, will want to go around this obstacle to stay with the depth it started at. It is very hard to move water from water 200 meters deep such as on continental shelves to water 2000 meters deep such as further offshore. There are exceptions to this rule, of course, but they involve other forces that usually, but not always, are small. A piece of ice, the size of four Manhattans, is heading our way. It broke free from northern Greenland last summer and has become home to seals and sea life off Labrador and Newfoundland, Canada. 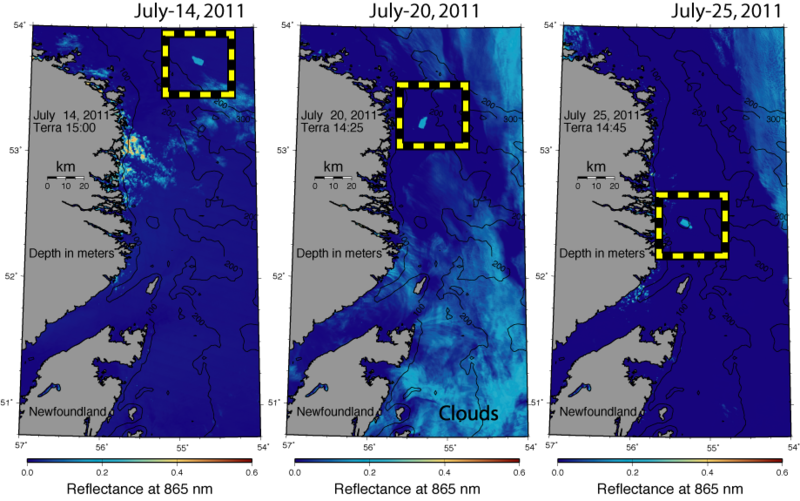 Ocean currents continue to propel it towards Hibernia oil fields and the rich fishery grounds of the Grand Banks. It is a tourist attraction as well. 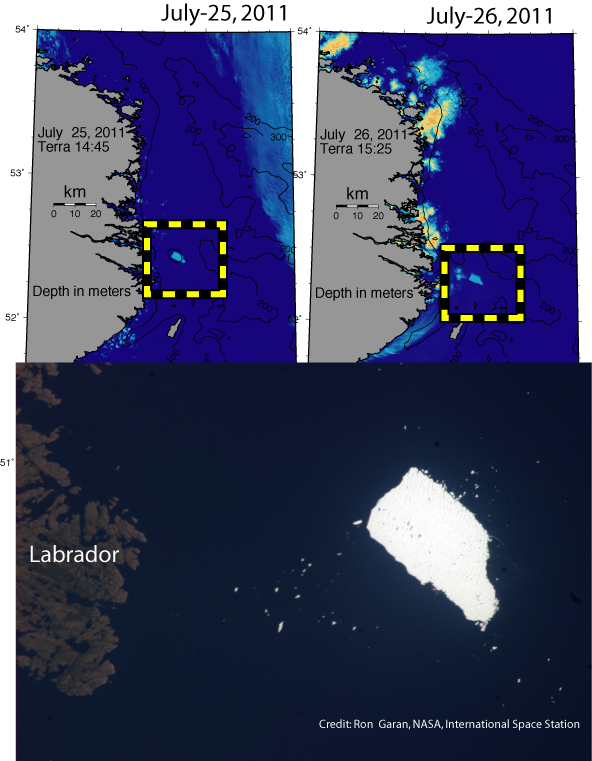 Ice Island off Labrador 20 km from the coast in water 100-200 m deep (from Terra/MODIS). This largest break-up from Greenland for at least 80-years has raised fears, that a warming climate will raise global sea level. While melting all of Greenland’s ice sheet would increase sea level in Delaware and Bangladesh by over 20 feet, this is unlikely to happen for the next 500 years. But how much does Greenland melt now? How much will our local sea level change the next few years as a result? Will it be inches or feet by the end of this century? In order to answer these questions, we need to understand how the melting of Greenland’s ice works, if it melts all the time, if it melts everywhere, and if its melting is accelerating. We all know that glaciers grow when snow accumulates atop and shrink when icebergs break off. As big as the ice island from Petermann was, it contributes only a seventh to Petermann’s normal overall loss. Ocean warming and circulation cause most of the rest. During both the cold darkness of winter and bright coolness of summer, the ocean melts the most ice below the surface where it is thickest. Furthermore, this melting can accelerate ice streams discharging ice hundreds of miles inland when thrown off-balance. Presently, these ice streams are held in place by a delicate balance of forces at the point where ocean, glacier, and the bottom meet. If this triple intersection of water, ice, and rock retreats into an existing landward cavity, then ocean water will rush in, enhance ice-ocean contact, increase the rate of melting, collapse the ice shelf, and thus raise global sea level. That’s bad for Delaware and Bangladesh, because it increases coastal erosion, flooding, and loss of wetlands that are nurseries for fish, crab, and shrimp. Ice islands breaking off Greenland are visible and dramatic, but the cost of them breaking oil rigs off Newfoundland are small compared with the costs of rising sea level due to accelerating ice streams and disintegrating ice shelves. These sucker punches will be costly for us in Delaware and Bangladesh. An ice island or two … pocket change.